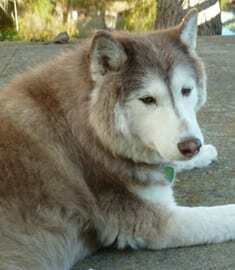 Torch died 3 July 2014, 14 years old, Siberian Husky. “No one wants a geriatric rescue dog,” “Won’t last long,” “Will only have medical problems,” “Will only die on me,” “I just buried my best friend, forever, a Rottweiler just two years ago.” These are the words that I had told my sister who had said that she had looked at a rescue dog that she would get for me. She got the dog anyway and I learned to “eat crow” as a matter of speaking. I got Torch on tax day, April 15, 2012 and on April 22, 2012 he turned 12 years old. He was a very sweet dog and the easiest I had ever had until he developed diabetes 7 months before he died of Pancreatitis. The first long walk that we had taken together, I had got lost which after finding our way back home, discovered that we had walked over 5 miles. The bred is appropriately named Husky. Even at 14 years of age and diabetic he was very sound. And when the weather was cold it seemed to invigorate and energize him. Daily we would walk 12 blocks in both the morning and the evening and sometimes a third time when I got home from work, depending on how hot the temperature was. I am a Substitute Teacher and work for 4 different school districts. One morning, 5:30 am, I would clip his leash to his collar and then open the front door so we could go for our morning walk. This morning I missed the ring on his collar, he knew before I did, he bolted to the end of the walkway, turn looked at me, I went after him, just a few feet from him he bolted again, down to the corner of the block, turned looked at me then waited till I got just about in reach then he’s bolt again, go 1/2 block, look at me and wait till I almost got to him and he’d bolt again. Catch me if you can. We did this for 6 blocks before he turned around and dash running past me and out of eye sight. I was in a panic. What was I to do? I could not go out looking for him, I would lose my job, I had to be at the school, I had no one to call, no one at the school till I got there. I worried about him getting hit by a car. I worried about him falling into the many keys and him not being able to swim or caught up by logs and weeds in the water and drowned. Saddened I decided to go home, get ready to go to work and prayed for Torch’s safety. After the 6 blocks back I walked though my front door which I had left open, closed it and there around the corner in the living room on his bed was Torch smiling at me. Both Torch and Bandit, my Rottweiler are genetically stored with ViaGen Pets and they are buried side by side at my home. They were both my BFFs and I love and miss them very much. Through Torch I discovered that my ideas of adopting a geriatric dog was all wrong.